^ Arctic Monkeys make chart history. BBC News Online. 29 January 2006 [5 June 2006]. ^ Arctic Monkeys win Mercury Prize. BBC News. 6 September 2006 [2009-07-21]. 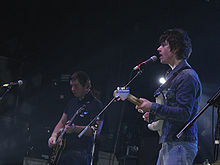 ^ Arctic Monkeys break America. Muse. 3 May 2007 [10 May 2007]. （原始内容存档于2007年9月27日）. ^ Barton, Laura. The question: Have the Arctic Monkeys changed the music business?. 《衛報》. 2005-10-25 [2006-06-05]. ^ Hanley, Lynsey. Monkeymania. New Statesman. 30 January 2006 [5 June 2006]. ^ Arctic Monkeys defend EP release. NME. 18 April 2006 [5 June 2006]. ^ Young Brains. San Diego CityBeat. 31 May 2006 [2009-07-21]. （原始内容存档于2009年8月29日）. ^ 9.0 9.1 Arctic Monkeys defend album cover. BBC News Online. 3 February 2006 [5 June 2006]. ^ Viewers' fury as Sharon Osbourne unleashes four-letter tirade at 'drunk' Vic Reeves. thisislondon. 23 February 2008 [24 February 2008]. （原始内容存档于2008年2月28日）. ^ Brits exposed to an Arctic blast. FT Online. 23 February 2008 [24 February 2008]. ^ Music for the Masses - I Think Not. Side-Line. 29 February 2008 [25 October 2008]. ^ 13.0 13.1 Petridis, Alexis. Whatever People Say I Am, That's What I'm Not Review. The Guardian. 2006-01-13 [2009-07-21]. ^ Gibson, Owen. A Mercury for the Monkeys. The Guardian. 6 September 2006 [2009-07-21]. ^ 15.0 15.1 A Scummy Man and Mardy Bums: The ultimate Arctic Monkeys album guide. NME. [2009-07-21]. （原始内容存档于2007-06-18）. ^ Morley, Paul. We love the 1980s. The Guardian. 27 January 2006 [2009-07-21]. ^ 17.0 17.1 Arctic Monkeys review: Reading Festival. NME. 2 September 2006. ^ Arctic Monkeys hide tickets in single. idiomag. 2009-08-16 [2009-08-21]. ^ George Clooney as Gordon Brown?. BBC News. 2006-05-24 [2009-07-21]. ^ Brown's Arctic Monkey admission. BBC News. 2006-09-24 [2009-07-21]. ^ Gordon Brown answers your questions. 《貝爾法斯特電訊報》. 2007-06-27 [2009-07-21]. ^ 23.0 23.1 Monkey business. BBC News. 2006-09-26 [2009-07-21]. ^ Ming's Arctic Monkeys test. BBC News. 2006-09-18 [2009-07-21].